In this animated sitcom, a CIA agent tries to live a normal suburban life with his wife and two kids. The family is wacky and far from normal, and like many an animated sitcom family, they also have to deal with a strangely intelligent talking pet and a wacky space alien. Watch Full Episodes of American Dad! A CIA agent will do anything to protect his homeland and family. When Klaus's goldfish body begins to deteriorate Stan transfers his consciousness temporarily into the body of a hermit crab. Hayley and Roger compete to see who can get the most views on their internet vlogging channels. Francine is happy watching vapid morning talk shows and ignoring real world news. When she decides to surprise Stan at work she accidentally discovers that Stan has been running her favorite show in an attempt to shelter her from the real world. American Dad! is currently available to watch free on Adult Swim and stream on TBS. 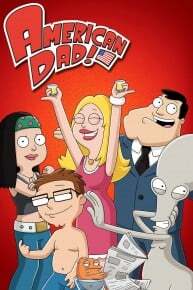 You can also stream, download, buy, rent American Dad! on demand at Amazon, Hulu, Vudu, TBS, FuboTV, Sling, FandangoNow, Google Play, iTunes online.